magnetism is finally coming into its own. We now know that fish are able to return to their spawning grounds by following the earth's magnetic lines or force, in the same way that birds do. Similar results have shown up lately, in beetles, crickets, bees, grasshoppers and flies. The magnetic sense is so strong in many insects that they will rest only in definite "magnetic positions". It wasn't long ago that an astute gardener discovered he could rid his fields of cabbage moths by scattering magnet fragments among the plants. The moths became so disoriented they left the property! Astounding research is fast moving ahead in the Soviet Union of the effects of magnetism on growing plants too. It's been learned that the famous "eleven year cycle" of plant and animal growth is directly related to fluctuations in magnetism caused by sun spot cycles. Through such studies, they were the first to discover that treating seeds with a magnet increased the plant yield, (South pole energy increased tubers and North pole energy produced larger above ground plants). Then they found they could get much the same results by treating the plant's fertilizer. Now they say they can vastly improve plant output - and increase the health of people, by magnetizing water! Bi-polar magnetized water (treated with both North and South poles) is the most often used form of magnetized water for alleviating most common ailments. The Russians are the pioneers in the use of magnetized water. They call it "Wonder Water". In his book "Magnets For Your Health" Dr. Louis Donnet, M.D., wrote, "magnetized water can be helpful in weight control, as an adjutant to a correct diet." He states (page 82) that he has seen over 100 successful cases. Because this water improves metabolic activity, it may be helpful in burning up excessive fatty tissue. Similarly to the way magnetized water dissolves the settled salts on the wall of boilers and radiators, so it has been reported to help unclog the arteries and veins of deposits of cholesterol and salts and normalize the circulatory system. Magnetized water has been found effective in alleviating colds, coughs, bronchitis, all types of fever and more. Dr. H. L. Bansal found it helpful in the regularization of women's menses. Magnetized water has been reported helpful for tiredness in daily activities. Biophysicist Albert R. Davis, a pioneer in magnet therapy research, wrote in his book "The Magnetic Effect" that he and his co-workers found they could overcome the early afternoon letdown by drinking a glass of magnetized water while relaxing for a few minutes. Place a glass or plastic container filled with water on the Magnetic Drinking Pad. Leave the container on the pad and add water as needed. You have magnetized water or fluid at all times. Fluids like juice, milk, tea, coffee and liquid type foods can be magnetized the way water is magnetized. Similarly oils, ointments and lotions used in ailments like rheumatism or for beauty can be magnetized. Magnetic facial cream is already available commercially. Most of us are not fortunate enough to get our water from free-flowing artesian springs, pure mountain creeks, rain water (unmixed with acid rain) or uncontaminated rural wells. Our choices are chlorinated tap water, bottled spring water or a water purification system. We need water. Living water. We need water to hydrate every cell in our bodies. But the water delivered to us from household taps is contaminated with chemicals, industry waste, effluent and garbage. It's also under such pressure that we now learn its life-giving energy is all but destroyed. We need water that is not only purified but revitalized to bring it back to something close to the life-giving, nourishing, cleansing element it was designed to be. That is apparently done through magnets. Independent research into magnetized water began in both Eastern and Western European countries. One grass roots researcher was a self-taught scientist by the name of Johann Grander. He claimed his knowledge came from studying nature in his native Austria. "In normal conditions," Grander wrote, "water flows either on the surface of the earth or deep underground, always seeking a natural course. In our water supply system, however, the water is collected and forced through pipelines under pressure. At this stage, the water suffers a serious aggression for the first time. The high pressures . . . are highly detrimental to the liquid. The water is then further contaminated by the addition of powerful chemicals, such as chlorine. However, we use it, the water eventually finds its way back to nature through the drains. We collect clean water from nature and return it soiled and sick." Grander said water has a double function. It supplies life-giving energy. It also acts as a waste disposal agent for all living beings. "Water picks up energy from the sun and collects the energies that are stored in the earth. In summer, with strong solar energy, the water pushes itself to the surface. In winter, with weaker solar energy, it burrows deep into the ground, collecting the stored and transformed energies. "It is an eternal circle in which water plays the main role. The water is also a living organism and therefore capable of transforming energies and refuse through its own microorganisms. Live water seeks by itself its sources of energy. Healthy water can be distinguished from sick water even by its murmurs." Dr. Klaus Kronenberg is a scientist who studies in both Germany and the United States. He is now an associate professor at California State Polytechnic University in Pomona, California. His original research used magnets in water treatment for industry. "Water is chemically neutral," he said, "but it is one of the best solvents known to man. It has the ability to entrap other substances. In other words, water tends to cluster around every non-water particle, forming conglomerations or complexes. Water's capacity to entrap substances results in its high mineral content. One of the most common is calcium carbonate, a substance that forms mountain ranges, such as the Austrian Alps. Most water supplied by water districts in (North America) contains a good amount of calcium content. This is important for proper taste and a healthy mineral balance." However, calcium is a problem in industry. It creates deposits of scale, like the accumulated scale in your kitchen kettle. Calcium is also a health problem when unassimilated calcium is deposited in human joints. Water softeners work as ion exchanges replacing the calcium carbonate with sodium, which is okay for industry, but it's not recommended for human consumption! Also, chemicals were in general use in North America and the chemical industry did its best to discourage the use of magnets ­ for obvious reasons! Even to Westerners, however, the genuine and practical effects of magnetic water treatment after prolonged use were undeniable. And Kronenberg states that there is no mystique in how magnets treat water problems. The positive effects have been confirmed through systematic research. When treatment devices with permanent magnets were developed, they were immediately successful! The build up of scale on new pipes was totally eliminated and the removal of scale deposits in old water pipes was soon evident. It was while he was at California State Polytechnic that Kronenberg contributed to the pioneering work in agriculture that re-used re-energized irrigation water with magnetic treatment. He says magnets actually change the nucleus of water. That is the source of its seemingly magical properties. A diet of magnetized water makes cows give more milk; chickens grow fatter and lay more eggs. And cantaloupes and other crops grow larger and have better yields with less fertilizer. Professor Israel Lin of the Israel Institute of Technology decided to use magnetic treatment on saline and brackish water, using an instrument costing less than $500(US). The unexpected effects were revealed during tests at Kibbutz Gvat. The 85 cows that drank magnetically treated water for three years produced a liter more milk a day, had fewer milkless days and conceived more easily, due to increased health and vitality. (Better than bovine growth hormone!) The calves not only weighed more than calves in the control group, they were leaner! Magnetic water had a similar effect on all farm animals at Kibbutz Gvat. Geese grew bigger, sheep produced more meat, milk and wool, chickens and turkeys laid more eggs and were prolific for a longer period. More dramatically, the mortality rate was reduced with less feed. Lin said the change of the water's properties is the key. "The magnetized water increases the solubility of minerals and therefore improves the transfer of nutrients to all parts of the body, making the organisms work more efficiently." "The shortage of nucleation centers in water is known to result from the capability of the water molecules to cluster around each foreign particle," Kronenberg explained. This renders it unavailable as a nucleation center. The forces of the magnetic fields on those water molecule clusters are very weak, however. The clusters vibrate in a number of ways. When they pass of a number of magnetic poles at a certain velocity the periodic changes of magnetic fields may coincide with one of the internal vibration frequencies of the water clusters. Resonance may occur and result in cracking open such a cluster. "The formerly entrapped particle is set free and the nearby mineral molecules rush from all sides to their nucleation center where they form circular platelets. The minerals that form the circular platelets do not have to be crystallized on a container wall. In turn, the number of hard crystals is reduced accordingly. The percentage reduction is the magnetic treatment's effectiveness rating." Many success reports specify that magnetized water maintains its property of scale deposit prevention up to two days. Kronenberg says some critics make this fact look absurd by calling it "water's ability to remember its magnetizing experience." "We do know," he states, "that the treated water retains its special scale-reducing properties while the calcium carbonate is present in the solid, inactive form of the micro crystals. We have examined these crystals under massive magnification in various waters and different treatments. 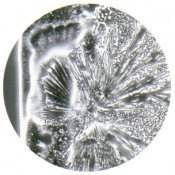 We can recognize in the 400-time magnification the clear prototype of the disc-shaped crystallization nuclei." He says that following magnetic treatment of water with a bad smell the odor was removed because "the dissolved sulfite minerals were changes into solid masses." Johann Grander says that because of electrical disturbances, satellites and especially through high water pressure, water loses its life force. And sick water negatively affects the health of people, animals and plants. On the other hand, water that has been revitalized through magnetic treatment is restored to its natural energy. Crops grow faster and stronger, flowers and plants are healthier and more resistant to disease; lakes, rivers and streams are helped back to health; and livestock and pets are more vigorous. Magnetic treatment for purifying and rejuvenating water is new in North America. Kronenberg says it's important that the public learns and understands the physical structure of water and the fundamental problems that presently exist--but don't show up in a chemical water test. The benefits of restoring the vital energy of water have economic, personal and environmental benefits. Unfortunately, government bureaucrats are so far behind what is really required to revitalize and purify our water that they refuse to recognize that chlorination is a poison, not a purifying agent. And magnetism is not magic. It's just slightly foreign to North American experience--but it's not going to make big profit for mega chemical companies! Every particle, atom, molecule, organelle, cell, tissue, organ and whole organisms resonate at its own particular frequency. EEG measurements show that the field generated by the human brain has frequencies in the extremely low (ELF) region centering around 7 -8 Hertz. This field is the 'wave envelope' of all the electromagnetic activity of the cells in the brain. It naturally resonates to, and is entrained by the earth's resonant field (the Schumann Resonance), but can also be entrained by artificially generated fields of the appropriate frequencies. (This is the basic theory behind the Pacer). This entrainment effect can occur in every cell, organ and system of the body. Certain bodily effects can be caused by applying magnetic fields which resonate to those certain biological frequencies. Thus events could be triggered which effect conformation of the body's molecules, alter rates of cellular, enzymatic or organic processes, alter chemical processes or just effect overall changes within the body. (This is the same operational theory employed by Royal Rife except that he used acoustic and electrical resonances rather than magnetic). As you all know by now, a wide range of biological effects have been induced by applying magnetic fields in both laboratory and clinical experiments. Back in 1982 researchers discovered the effects of magnetic fields on ion flux through cell membranes. For example, the increased flow or movement of calcium ions within a magnetic field led doctors to place magnets above and below bone fractures in order to speed up calcium accumulation at the break thus causing the bone to heal faster. Experiments in 1985 confirmed that other bodily elements such as sodium, potassium, magnesium, etc., were also affected by this process. In addition, we know now that molecular alignment will occur within intense magnetic fields. Experimental results have shown that muscle fiber, membranes, chloroplast, retinal elements of the eyes, and other fibers and macro molecules including nucleic acids have been aligned in an intense magnetic field. Highly oriented structures can result from this which may interact with other biomaterials in your body. Cell membranes, for example, are liquid crystals which are very close to change depending only upon bodily temperatures. Thus magnetic fields could affect the membrane's fluidity or other properties. It only takes a very low intensity magnetic field to effect chemical reactions and these reactions have a definite biological effect on your body. Consider any one of your blood cells for a moment. It is composed of a membrane which separates two bioelectrical charges caused by the action between the potassium ion (positive charge) and the sodium ion (negative charge). This bioelectric action exists in all of your body's cells, in nerve transmissions, in the red blood cells and even in whole blood. We could take a sample of your blood and spin off the fluids to leave only red blood cells, then place these cells under a microscope. If we then brought a magnet close to the cells you'd see the cells all spin around and point in one direction. The magnet 'lines up' or polarizes the ions and iron in the cells. (An ion is an atom with one electron too many or too few). When the cells spin around, which way the spin is extremely important. The North Pole causes the blood to spin in a counter clockwise direction and decreases hydrogen concentrations. The South Pole causes the fluid to spin in a clockwise direction and increase hydrogen production. The South Pole offers a positive form of energy and speeds up activity. The North Pole provides a negative form of energy and slows down cellular activity. If you can understand that the principal effect of magnetism is to control the hydrogen ion you'll have a better understanding of pH. The control of hydrogen ion is the single most important chemical action taking place in your body! All disease and health depends upon how your body handles the hydrogen ion. Every single organ and all of your tissues have a set hydrogen concentration known as potential hydrogen (pH). The hydrogen ion controls the acidity or alkalinity of your organs and tissues. When you know how to measure and control this hydrogen potential you have the answer to solving all of your health problems by getting into a disease immune energy field. Your body normally controls the pH through your nervous system (which is why stress is so damaging to you). Medics describe your nervous system as consisting of two parts; the para-sympathetic system and the sympathetic system. Though this may sound confusing, understanding this will definitely help you in your self healing efforts, so read on. The sympathetic nervous system activates the adrenal, pituitary, heart, thyroid, ovaries and gonads by increasing the hydrogen ions. It inhibits the stomach, liver, intestinal tract, pancreas and bronchial muscles by decreasing the hydrogen ion. The para-sympathetic nervous system does exactly the opposite, ie. It activates the stomach, liver, intestines etc. and inhibits the adrenal, pituitary, heart etc. by increasing or decreasing the hydrogen ions. Thus, this change of energy acts to speed up or slow down the function of the organs and tissues. If the heart is too slow the sympathetic system speeds it up. If it is going too fast, it’s the para-sympathetic system that slows it down. In order for the entire nervous system to operate properly in this way it must have the proper concentration of pH! Therefore, if your body can keep your energy fields in correct balance you can attain a disease immune condition. Degenerative diseases then start going back to a normal state and normal health returns. According to Dr. Richard Broeringmeyer magnetic energy and proper placement of that energy to the areas involved is an easy and fast way to bring the body back to this important balance. [The Dr. uses medium strength magnets for 1 - 3 hours daily for most of his treatments but normally, if continuous treatment is desired he substitutes 'bio bandage' type magnets. In other words for long treatment times, such as overnight, he prefers a weaker magnet than is used for short treatment periods. This is where a bio bandage and magnetic bed pad would prove invaluable]. Soviet researchers are also convinced that magnets act as living things through water or water solutions involved in the functioning of cells and tissues. As we've mentioned, magnetic fields can change the ionic of molecules (and thus their pH content) but an additional fact should be brought to your attention. Heating water also changes its ionic balance and induces excess of positive ions - which can produce health hazards of its own. Once thought to be ridiculous, today magnetized water is becoming universally accepted, even if it can't be fully explained. Water passed thru strong magnetic fields is now being used in industry and medicine in Russia, France, and the U.S.A. and other countries. The Volga Research Institute now irrigates huge areas with magnetized water. The water has been found to give a 28% increase in winter wheat, 17% in corn, 37% in cucumbers and 32% in tomatoes! So impressive have been the results that a special crop sprinkler is now being mass produced, which magnetizes the water. (A similar device is also being tried, here in Washington State, to increase the fertility of rainbow trout)! In addition, factory engineers in the Soviet Union are using methods of steam boiler water magnetizing for reduction of boiler scale and the textile industry is experimenting intensively with dye magnetizing. To continue on, magnetic fields also effect your circulatory system. Research in 1981 proved that magnetic field effect electro cardiograms (EEG). Alterations in the brain's T wave were reported at very low intensities and were shown to be due to the electrical potentials associated with the flow of blood through the magnetic field. Several studies have thus demonstrated the feasibility of exposing the entire body, or a large segment of it, to an outside magnetic field in order to affect blood flow rates in major circulating vessels. In view of the deprivation of magnetic energy in most areas of the country, coupled with electro magnetic pollution by power lines and numerous household and industrial devices, it isn't surprising that the bio-electric field surrounding and permeating your body is not what nature originally intended it to be. Any departure from the same kind of electro magnetic environment under which life evolved on this planet may be responsible for a variety of physical and emotional ailments. This problem is what one leading Japanese Doctor, Kyoichi Nakagawa, is now calling "magnetic deficiency syndrome". Nakagawa published an influential study in the Medical Journal in which he described this syndrome and its remedy - magnetic treatment. The doctor first noted that the strength of the earth's electromagnetic field (EMF) has decreased 50% in the last 500 years and continues to do so at about .05% yearly. He pointed out that modern living conditions with its steel buildings, cars, trains, buses, airplanes and subways, all deprive humans of necessary, beneficial and regular exposure to EMF. The average person, he concluded, is therefore deficient in low level EMF intake, and as the human biofield is strongly liked with that of the earth, various vague but chronic forms of disease have set in. It is interesting to note that prior to great flood of Genesis, man's diet was solely vegetarian. After the flood, man's diet altered to one that included animal proteins. Could it be that the earth's magnetic protective field had changed in some way? Nakagawa's remedy for magnetic deficiency syndrome is extremely simple. He recommends that distressed people wear a magnetic necklace, bracelet or ring, or use 'magnetic buttons' or sleep on a magnetic mattress pad. (These should all range from a few hundred to 1300 gauss). "Generally, these magneto therapeutic devices apply a stationary magnetic field to the human body," Nakagawa writes. Bio-magnetism works in the human body through the circulatory system, the nervous system and the endocrine system. Magnetism is continuously penetrating every known particle, right down to the atom. Its ordering effect on living systems arises from the fact that magnetism is a blueprint of life itself. All known energies have as a base this electromagnetic field. The latest research indicates that magnetism has a very significant biological effect on human beings and is confirmed by the research of Dr. Robert Becker in his book "The Body Electric." Dr. H.L. Bansel points out that magnetism increases the electrical conductivity of the blood. A weak current runs through it and the quantity of ions are increased. The newly ionized blood circulating throughout the body can significantly contribute to the efficiency of the blood flow as well as having a stabilizing effect on both high and low blood pressure. Dr. Linus Pauling received his 1954 Nobel Prize for his discovery of the magnetic properties of blood. Blood contains ferrous hemoglobin (iron) that functions as a carrier of oxygen and carbon dioxide. As the blood circulates in the lung, fully magnetized ferrous hemoglobin is able to transport more oxygen to cell tissue as well as taking more carbon dioxide waste from the cell back to the lungs for removal. This means more energy and less fatigue as tissue cells and internal organs stay substantially healthier. Bio-magnetism works to regulate and normalize hormone secretion in the glands. It is currently believed that the increased electrical current being produced forms like a net around the glands and secretory duct. An extra concentration of oxygen stimulates production while the electrical net regulates optimum secretion. As a result, conditions caused by a lack of hormone secretion or a hormone imbalance are affected through normalizing the hormone functions within the body. Hormones play an extremely important role in rejuvenation and in general energy levels while proper circulation ensures that the hormone level is evenly distributed to all parts of the body. When magnetic flux passes through tissue, a secondary current is created around the flux lines in the tissue cells. This function of the cell becomes strengthened as the cell; metabolism responds to the bioelectrical currents initiated by the magnetic flux. This current induces muscle spasms to reduce and the activated cell metabolism lowers inflammation in the tissue. The increase of cellular metabolism aids in the regeneration and re-growth of cells. The negative pole energies of magnetism interfere with the nerve cells ability to send pain impulses to the brain where the pain is registered. Blood cells have potassium in their centers which have a positive bioelectric charge. The nerve cell differs in an opposite way. During a pain response the outside switches to potassium with a positive bioelectric charge. Through attraction, the negative pole charge of a magnet creates a "blend off" of the potassium's positive bioelectric as the natural flow of current toward the negative pole. As Life Sources, Inc. continues its research in "whole body" functions at a cellular and atomic level, we will continue to make the information and modalities available to our clients. We use the most powerful Neodymium magnets available on earth, which last a lifetime. Neodymium magnets lose their magnetism by 0.01% per annum. That's 1% loss every 10 years. Our unique design allows for a range of pipe sizes to work on each unit. How does, Magnetic Water Descaling work? 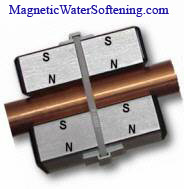 Magnetic Water Conditioner. Do they work? 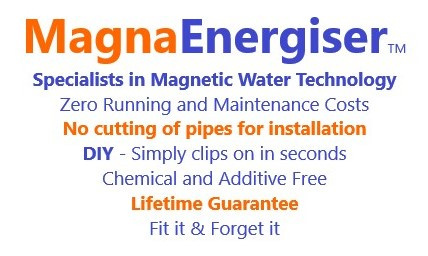 We guarantee results, using our Magnetic Water Softeners, or your money back. 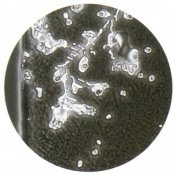 Some companies sell magnetic limescale remover systems designed to have their magnets placed in the mounting frame so they may either oppose or attract each other. 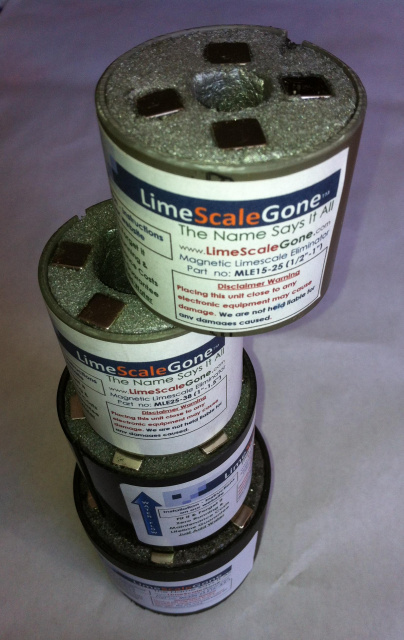 (Example shown in the image to the left) These magnetic lime scale remover configurations do not work nearly as well as our tested design, plus, we use the most powerful Neodymium magnets available in all our units. Most of our opposition use cheap Ferrite magnets, which don't last. Permanent Magnet Water Softeners to Eliminate Hard Water and Lime scale Calcification through Totally Green, Non-Chemical Technology. Technology for improving energy efficiency through the removal and permanent prevention of lime scale (calcium carbonate)build-up in water pipes, around water heater elements and appliances. Water Softeners have been Laboratory tested and proven to help alleviate skin inflammation for people suffering from eczema.